Marianne explains the benefits of slow and steady decluttering in this comment. Lucinda has had some insight recently as to what living with much less is like. Read about how it has inspired her here. This comment is also from Lucinda. I love that even though she feels her home is still quite cluttered she doesn’t sound negative about it. Sanna tells us in this comment how having less stuff is working out for her. I like Michelle’s method of making sure her indoor tools and her garage tools don’t end up in the wrong place. 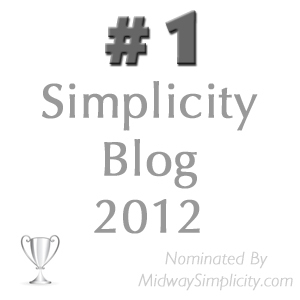 http://midwaysimplicity.com/how-to-have-a-life-full-of-experiences/ This was a good post from Tohami at Midway Simplicity. I have read his latest eBook ~ The P.A.S. Technique ebook ~ and am suitably impressed. I will write a Saturday post on that soon. I loved this link sent to me by Cindy. If I ever find a Fixer’s Collective like this in my area I am in. Declutter some pantry or refrigerator items that you used once for a recipe but have not found a use for since. I think the ingredients, that tonight I will pass on to my daughter when she comes for dinner, may actually have been bought by her while she was living here recently. Of course I enjoyed her cooking for me, but she is more experimental with her cooking than I could be bothered with, so she is more likely to use these items than I. Save water and electricity ~ Think twice about how often you really need to wash your clothes and linens. Underpants and perhaps socks are the only clothing item the really need to be washed after one use. Most other clothing items are usually clean and fresh enough to wear twice unless badly soiled the first time round or if the weather is extremely warm and/or humid. Sheets need only be washed once a week at most while towels can last up to a week provided they are air dried between use. Thanks for sharing the news about my ebook Colleen. My pleasure Tohami. Thank you for allowing me to read it. I will send you an email with my thoughts on the matter or perhaps we should have that skype call as I am interested to discuss the results. Colleen, some good stuff here. 1. I like the “The things I have.” One thing my inventory taking is showing me is that we still have way more than we need. It’s all nicely put away and out of sight but that means nothing. It’s still stuff we don’t need. 2. It’s nice Jane could share the web site for getting rid of old video tapes and such. 3. The article Moni sent the link for was very good. I liked the use of Kenny Roger’s old song to get her point across. 4. Mohamed Tohami’s ebook sounds like it would be good. I’m glad he has this new one out. 5. I would love to be part of a Fixer’s Movement. I try to fix as much as I can and have even fixed things for others. I like the idea of beating the manufactures built in obsolecence with repairing instead of dumping and buying new. Hi Deb J, they were all good links. I particularly loved the one on the Fixer Movement. I am determined to do some investigating when we get settled into our next home to see if there is such a group in the area. I’ve been thinking about trying to get a group of people from church together to do fixing. I think it stinks that so many people have to chuck something in the bin because they have no clue how to fix something but there are people out there who can. Great idea Deb. There are probably lots of tradesmen in your congregation who have all sorts of skills. I loved the links! And I have to admit: learning how to fix things is addictive! You can say that again Dymphy. My mum and dad were good at this and passed it on to me and my siblings but there is so much more I would love to and could learn. I must look into this. Maybe even just do a few free DIY classes at my local hardware store. My father was a fixer. I think his generation and those before all were. Now our goods seem so cheap and we are conditioned to think it isn’t worth getting an item fixed as labour costs make it more expensive than the original good (which was probably manufactured in a third world country with poor labour protection and pay). So we have lost the skills. Now with YouTube people are sharing and relearning skills. Let’s save our money and save landfill and save all the pollution that comes with the original production of resources and manufacture and transportation of stuff! Great link, Colleen. This is one I’ll save in my favourites. Hi Lucinda. I agree that most folks have lost the skills for repair work. And just trying to find someone who can do the work for a reasonable price is practically impossible. I have not read the links, so will have to catch up on that. My grandfather (now passed) was fantastic at fixing things. Miss that quality about him. I understand what you both are saying. My dad was the fixit man and he taught me a lot but I still have to get help sometimes because things are so different now (like cars have those little computer chips that go out and have to be replaced). Lucinda ~ You are right on all points about inexpensive goods. Throwing electrical goods away that have stopped working has never sat well with me. I always investigate the possibility of repairs but usually to no avail. As you say the repair costs more than a replacement. It is such a pity. Wonderful week Again! I totally agree with Lucinda about holidaying in a two bed apartment, how much less you can live with! I am getting myself organized to get our Tax returns done today. It is a good opportunity to decide what bits of paper I really need to keep. Is an envelope with account numbers and what I think are passwords scribbled on it really worth keeping? I am making an effort to only have items that are important in my folder. Would someone be able to recognize what is important and what is rubbish , if I have scraps of paper and outdated info in my folder? My decluttering has ramped up a bit. I now ask myself the question, if I died and my family was going through my belongings, how often would they say ‘ why did she keep this?’ and ‘what is this for?’ ‘Is this really important, should we keep it too?’ I am not being morbid, just practical :). If you don’t know what is written on that envelope them perhaps no one else will. Better check with the hubby first but. I wouldn’t take it anywhere near the accountant though, they might put two and two together and you may end up with an empty account. I like the sound of this decluttering ramp up. Go Wendy! I’m new to your website. Love it! My spin on Today’s Mini-Mission. I’m going through my pantry and freezer and pulling out items that must have been purchased for some recipe or another, but never used. (Hoisin sauce, polenta, unsweetened baking chocolate squares, semolina flour. No idea!). Next I’m going to Google some recipes with those ingredients, or use a recipe website includes that feature. It would be amazing if I can use those things all one recipe. We’ll see! Hi Leslie and welcome to 365 Less Things. I am glad you are finding the site useful and I wish you ever success with your decluttering tasks. I also wish you luck using up those ingredients. Try taste.com , I find it very useful for finding recipes. I have tried a few and have had success with every one of them. Doubt you will find one to use all those ingredients in one go and I am not sure I would want to taste it if you do. 😉 I do however want to hear about it if you do. Either way, use them up and clear a little space.